Ear infections commonly plague children, and also affect some adults. The infection typically affects the middle ear (otitis media). 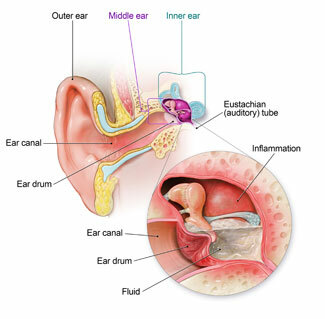 The eustachian tubes inside the ears become clogged with mucus and fluids. The resulting pain and itching can become almost unbearable, causing difficulty sleeping and leaving you even more miserable the next day. If you are at your wit’s end on how to sleep with an ear infection, here are some useful tips to help ease the discomfort. Since the eustachian tubes in the infected ears can only drain into the throat, try keeping the infected ear elevated by sleeping on the opposite side of the one infected. This way the tube will be above the throat, and the ear will most certainly drain sooner. Another way is to elevate your head using several pillows, which may help drain the eustachian tubes. To raise the head of the bed, place five or six inch wood blocks under the bed legs at the head of the bed, or purchase a wedge pillow, which can be placed between your box springs and mattress. A heating pad is an excellent way of how to sleep with an ear infection in order to keep the ear from hurting, and it helps bring blood circulation to the infected ear to aid in the healing process. Take an over-the-counter (OTC) pain reliever such aspirin, acetaminophen, or ibuprofen before bedtime. Note: Children less than two years old and teenagers presenting with cold or flu-like symptoms should never be given aspirin. Drink water before preparing to sleep. The act of swallowing may help trigger the muscles that help facilitate the eustachian tubes to open and drain, thereby reducing pressure. If the ear infection is related to nasal or sinus congestion, use an OTC nasal spray or decongestant before bedtime. However, when using a decongestant nasal spray, only use it for 24 to 48 hours, to avoid worsening the nasal congestion. Place a couple of drops of garlic or olive oil, and a drop of Lobelia or mullein oil (available at local pharmacies) in the infected ear, then use cotton balls to loosely plug your ears. Unfortunately, children do not know how to sleep with an ear infection. When an ear infection occurs, there are several things that can be done to soothe your child until you can see the pediatrician. Use children’s ibuprofen or acetaminophen (when fever is present), but never use aspirin for pain, and don't bother using cold remedies. To help ease the pressure, elevate your child’s head when sleeping. If the child is more than two years old and is no longer sleeping in the crib, it's fine to use a pillow when resting. Keep your child in a semi-upright position in the car seat when travelling. Applying a warm, moist towel near your younger child’s infected ear may also be of some help. With older children you may want to use a heating pad; however, remember to keep the heating pad on its lowest setting and never use heating pads with infants. When there is no drainage, help lessen the pain by using a few drops of olive (room temperature), into the affected ear. When there is some discharge, use a cotton ball gently tucked into the ear canal. Since swallowing opens up the eustachian tube and helps drain the fluid from the middle ear, encourage this by letting your older children (four or older), chew gum (sugarless). Have your children drink plenty of fluids to help avoid an ear that is plugged from turning into an ear infection. Warning: Untreated ear infections may cause permanent hearing loss in both adults and children. See a physician if your ears are plugged for more than two to three days, or if you experience any hearing loss. More importantly, if you feel a sharp pain, followed by drainage of pus or blood from the ear, see a physician immediately, because you may have a perforated eardrum. Though ways for how to sleep with an ear infection can help, it's best if you or your child didn't get it in the first place. Although most ear infections are not preventable, there are things you can do to lessen the risk. Breastfeeding: Since the antibodies in your breast-milk may help protect your child from ear infections, and other medical issues, breastfeed your baby for 6 to 12 months if possible. Proper Bottle Position: When bottle feeding your child, remember to hold them in a semi-upright position so the formula doesn’t flow back into the eustachian tubes, and for the similar reasons, avoid bottle propping. Avoid Secondhand Smoke: Second hand smoke can contribute to ear infections in children. Protect your child from any exposure to secondhand tobacco smoke, which might make ear infections more frequent, and severe. 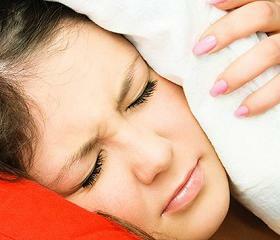 Treat Colds: Remember, those ear infections are many times preceded by a cold. Most of the time the clear mucus from a runny nose will turn green or yellow before an ear infection sets in. When runny noses from a cold start, it’s best to keep the nose clear by using saline nose drops, steam, and suction. Healthy Environment: When your child is in a child care facility, the risk is greatest for an upper respiratory infection, the common cold, and ear infections. Large daycare providers are an ideal setting for germ sharing. When possible, keeping your child in a small, home daycare setting will lower the risk. Echinacea: This herb may effectively and safely boost the immune system. Echinacea comes in children’s chewable and drops as well as adult tablets and liquid. Children’s drops may be added to food or juice, and there should be a recommended number of drops according to the child’s weight. Vaccinations: Ask your child’s doctor if flu shots and pneumococcal vaccines are appropriate. The vaccine is considered a more valuable benefit from the flu shot. The vaccine significantly lowers the possibility of ear infections caused by pneumococcus that are antibiotic resistant.